You may have noticed that I’m currently loving Dead Cells. 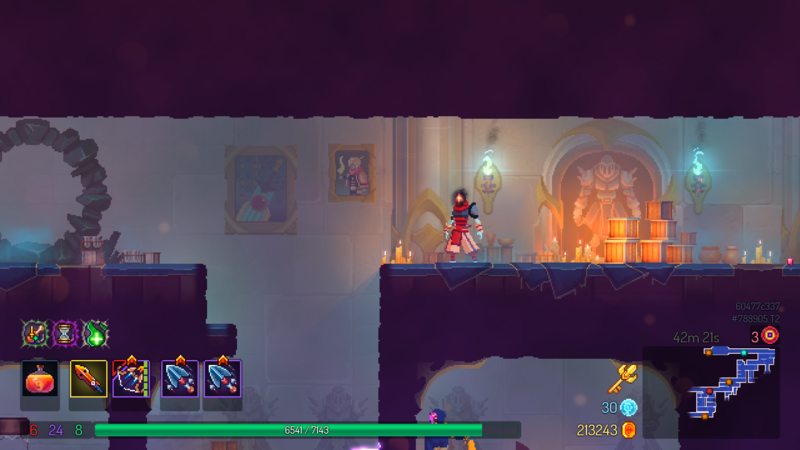 I already wrote 2 articles, shill here: My opinion after a dozen or so hours, Dead Cells Tips For Beginners and so to complete my trifecta, here’s some cool touches in the game. So I literally completed my first run today. After many hours of dying just before the final level (at least so far), I visited the High Peak Castle more times than my family. Through it’s lavish corridors and ornate walls, I mercilessly slaughtered many of the kings men. I spared all the king’s horses though. I’m not that sick. Now and then, when I could get a breather and wasn’t too tense to notice, I started to recognise certain gaming icons on the walls. Apparently the king is a fan of fantastic games. Among the elaborate decor you’ll find many portraits scattered around the castle walls. Take a closer look and you may see some familiar faces. The very first one I noticed was from the incredible game Transistor. Among other icons, the always fabulous Solaire was doing what he loves to do. Praising the sun. As far as I’m aware these are just references to these games and have no other impact on the game beyond aesthetic. It’s a nice touch though. The publishers, Motion Twin, clearly love video games, not only is it shown in these details, but also in their well crafted game. There are other video game references in these portraits and throughout the game but I’ll leave the rest to be found by yourself. 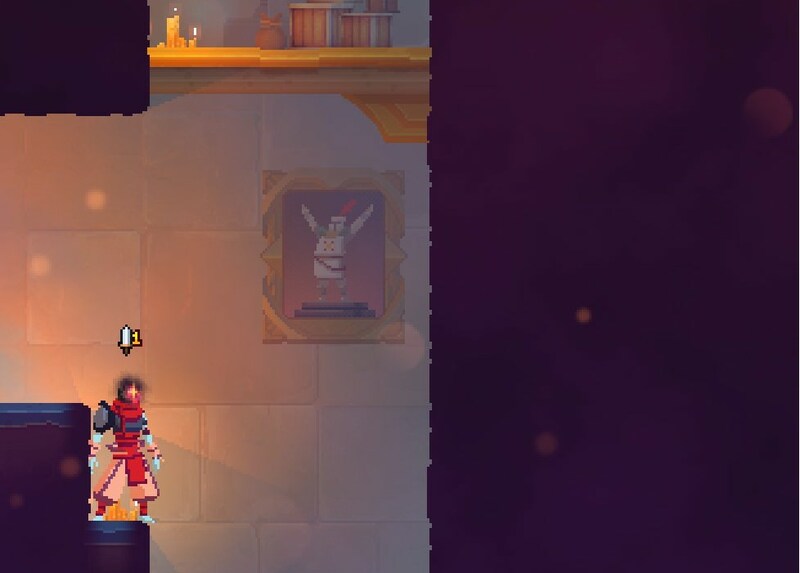 So, next time you’re going through High Peak Castle, take in the artwork when you get the chance. Currently I’m trying to clear a Dead Cells run. I got far but not far enough, yesterday I got to the final boss (I think it is anyway) and died miserably. But I now continuously get within range of that fight. I’m not a master of the game but I’ve got a few tricks up my sleeve. So here are a few things I’ve learned and you never know, they may help you too. Everyone will have their own way of playing Dead Cells. Some will prefer bows to shields, or traps to grenades. I’ve no intention of saying ‘There’s only one way to win and if you don’t do this you’re stupid’. What I will say though is on each run, pick a focus. To simplify; there’s 3 stats you can upgrade. Brutality, Tactics and Survival. For your best chance, even though I know it’s tempting to spread your upgrades evenly, try to funnel most of the upgrades into one category. Specifically, a category that buffs most of your gear. Combine that with the right mutations and you’re building a strong run. For example, Twin Daggers, Firebrands, Powerful Grenade and Fire Grenade, which are all Brutality gear (red colour). Add the mutation which lets grenades almost half their cooldown, throw in 10-20 stat increases into the Brutality stat and you have a strong bit of kit. Continuing on from my ‘pick a focus and stick to it’, I’ll now say, maybe don’t always do that. Yes, I’m being contradictory! For good reason too. This game isn’t Blondie’s One way or Another. It’s not black and white. Pick a focus but be flexible. If you find gear along the way that is better than your current gear, give it a go. It may not be in sync with your other weapons but its overall stats may be better. Not only that but……. ……..Use weapons that you’re comfortable with. Now if you did that all the time, you wouldn’t get better at this game and you’d be shooting yourself in the foot constantly. Try out other weapons and see what gear you prefer. I’d advise that a run that is going swell though isn’t the time to try new toys. If it’s working for you, why change it too much. I am a bow person over a shield person. I prefer the offensive approach and haven’t found my flow with shields. That’s why when I’m on a good Dead Cell run, if I have a Quick Bow II and come across a Front Shield V, even though I know the Front Shield is better stat wise, I’ll keep the bow. If you’re on a run where it’s pretty weak or in the early stages then go nuts and try out new gear. Remember though, just because you find higher level gear doesn’t mean you need to take that over a weapon you know. Play to your strengths, nobody else’s. Downward smash is your dear friend. Not only does it damage enemies you land near, but it also stuns them. On top of that, it negates being stunned from falling great heights. If you know the layout and what’s below I would almost always recommend slamming into the ground. I don’t recommend doing it if you don’t know what’s below though. Nothing more demeaning than pile driving yourself into spikes (yes I got the trophy for doing that). As long as there isn’t spikes or a pit you’re not only making a grand entrance to your foes but also shaving precious seconds off your run. Which, brings me to timed doors. Timed doors offer great rewards for those that risk it for a biscuit. But slow down Sonic, there’s no rush early on. Play the game at your own pace in your early runs, once you find your flow and how the game controls you’ll find that you can breeze through certain enemies. Once you have confidence in yourself and are comfortable with the controls, my advice, would be to always start like a sprint rather than a marathon. If you rush and die in the first level, what does it matter really? Survive and get access to the timed door and you’ve already set yourself with extra cash and cells to upgrade with. Overall you’ve made your game easier, even if you die in the next level, your Dead Cells experience has improved. Once you’re confident in your skills, then always go for the timed doors. If you miss one by a few seconds, screw it, get the next one. If you’re trailing behind by quite a bit, then forget about it. Explore all the level, kill all enemies you can and relax a bit. If you can, always go for the timed doors, but that is once you’ve learnt the general level layout and enemy types. Otherwise, you’re just rushing to your doom. Lastly, have fun. You don’t need to complete Dead Cells straight away. The more you play, the more you improve your chances. Even if you only spend 1 cell the entire game, that is still 1 cell more than you had the previous runs. It’s a game that greatly benefits from your time. When you die, think of all the cells you put towards your future endeavours and hit that restart button. Best of luck. We all now know Sonic and Mario exist in the same universe. I mean, they compete in the Olympics together. But does Po and the Kung Fu Panda universe also share the same space? The answer…..is no. Of course they don’t. That’s a shame as this article would be better if it did. I’ll leave my fantasy aside for now and explain the connection. So in the Mario Kart 8 level Ribbon Road, the racetrack takes place in a kids room. As in, Mario and crew are racing on a child’s toy race track in a room that suspiciously looks like Andy’s room from Toy Story. There’s a lot I could write about here, like where are these giant humans who built this? Are they even humans? Calm your brains. Today, none of that matters. What we’re after, is a poster. A poster with a very similar image to a real Kung Fu Panda poster. Instead of the titular panda demonstrating his moves, we are treated to a Lakitu striking a fighters’ stance. More than likely the design team decided to do a joke poster on a film they like but I prefer a different idea. I like to imagine that in this universe, the Kung Fu Panda series exists and that Lakitu is like the Wayan’s brothers of the film industry and is the star of spoof films. Other classics include The Incredible Lakitu, Lakitu by the Sea and my personal favourite, 12 Angry Lakitus. Lakitu’s one man film, it’s like The Nutty Professor but, you know, good. Author FitzyPosted on March 20, 2018 March 20, 2018 Categories Tips, Tricks and TriviaTags Gaming, Mario, Trivia, Trivia Time, Video GamesLeave a comment on Trivia Time- Kung Fu….Turtle?